By now, you may have read about Zach Feinstein, a 5'8", 130 pound, D-III Caucasian who does "not play basketball," declaring his eligibility for the upcoming NBA draft. By simply submitting a letter to Commissioner Stern and filling out required paperwork, Feinstein is officially a declared and eligible. HuggingHaroldReynolds was lucky enough to catch up with the Washington University in St. Louis Junior for what we hope is Part 1 of a multi-part conversation with the baller. Be sure to visit DraftFeinstein.com for scouting reports, stats, and additional information. HuggingHaroldReynolds: Now, we checked the records and you are in fact white and don't play basketball, how does that effect your draft position? 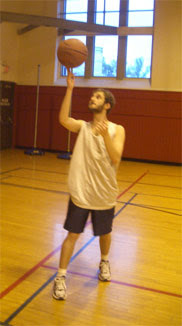 Zach Feinstein: Well every year there are many non-white players, who do actually play basketball. Most of these players go undrafted, so this probably gives me an edge. HHR: According to math I just did in my head, if you change your last name to a more Eastern European mess of all consonants, it would improve your draft ranking by a factor of 10,000. How far are you willing to go? ZF: First, 10,000 times 0 is still 0 (I am majoring in math so I'm fairly confident about this). Secondly, this may have worked if it weren't for Nikoloz Tskitishvili. HHR: Will you simultaneously be lobbying for a "lightning round" based on trivia? ZF: Good suggestion, the less time a team has to think about it, the more likely they are to take me. HHR: Would you consider playing a year in China just to look taller? ZF: We will see how my Summer in China goes. It really depends on the offer though. HHR: Have any shoe companies reached out yet for endorsement deals? Vitamin Water? ZF: Not yet, though I would love to get a shoe deal for driving shoes (I suggest Google-ing these comfortable, comfortable shoes). And although I have gotten multiple offers from people who would love to be my agent, I have turned them all down so far. This has probably hindered my negotiations for endorsement deals. HHR: Let's be honest, this is also a beauty competition for low market teams looking to give their fans something to come out and see. Do you have a nickname? A signature move/dunk? ZF: I do not have a nickname. I will be creating a contest on draftfeinstein.com looking for suggestions from readers to come up with my nickname, and this is being announced on Hugging Harold Reynolds first. As for a signature move - that would be creating a website. HHR: Where did this idea come from? Honestly it's pretty damn funny. ZF: From the site: "The story begins in April of 2007, when one of my roommates (Dan) suggested that we should declare for the NBA Draft the following year. He, of course, said it jokingly. I, however, thought he was serious." Just from hearing stories other people have related to me, it seems a lot of people think about doing it every year, but few have the motivation to look into how. Maybe this will help out those who are confused as to how to declare for next year's draft. HHR: Do you have your draft day suit picked out? ZF: Well I plan on following the same trend I do for clothes every day; take what is at the top of my dresser. HHR: What happens if you don't get drafted? ZF: In that unlikely situation, I will go back to what I was doing last week before the official Early Entry list was released. Haha. This is pure comedy. I hope you get drafted Zach. I'll be pulling for you. Maybe you can convince Minnesota's GM to draft you. Their team is mostly black with the exception of Marco Jaric Come with the affirmative action angle, you know? Let them know you will bring racial equilibrium to a struggling franchinse!